Hey foodies! I know, I have been gone for a long time. Cooking and food photography was happening, but I wasn't able to blog. 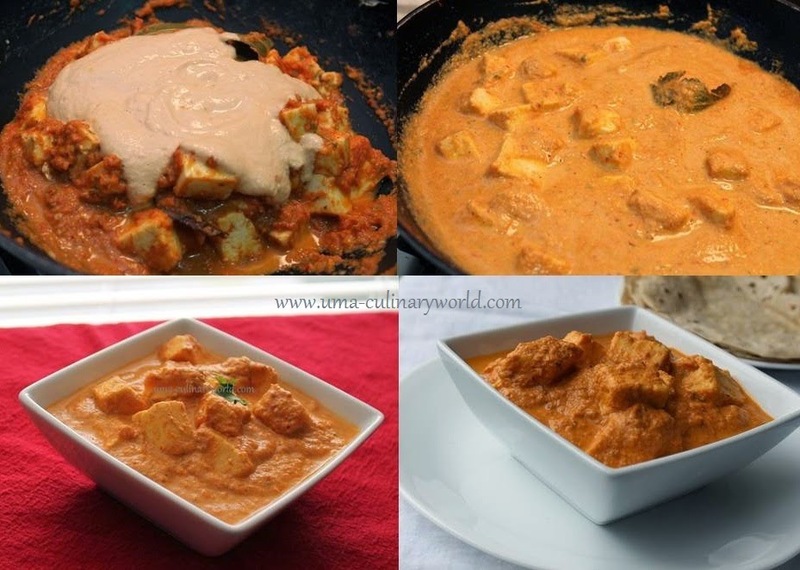 Now, I am back with everyone's favorite Paneer recipe - Paneer Makhani also known as Paneer Butter Masala. My version is more like Badami Paneer. Hope you guys like it. Soak almonds (or any other nuts) in about 1 cup of water overnight. Peel the soaked almonds and blend them with milk to a smooth paste. Set the almond milk paste aside. Julienne slice the onions. Medium chop ginger, garlic and tomatoes. Break the chilies into 2 or 3 pieces. Discard the seeds if you want to reduce the heat of the chilies. Heat oil or butter in a kadhai or a pan. Add fennel seeds. After few seconds, add onions. Saute until onions soften. Next, add ginger, garlic and dry red chilies. I use Byadagi variety of dry red chilies which are mild. You can use Kashmiri Lal Powder as well. Saute until onions turn slightly brown. Lastly, add tomatoes and continue cooking until tomatoes are soft and mushy. Let this onion tomato paste cool. After cooling, grind it to a smooth paste. Add little water if required. 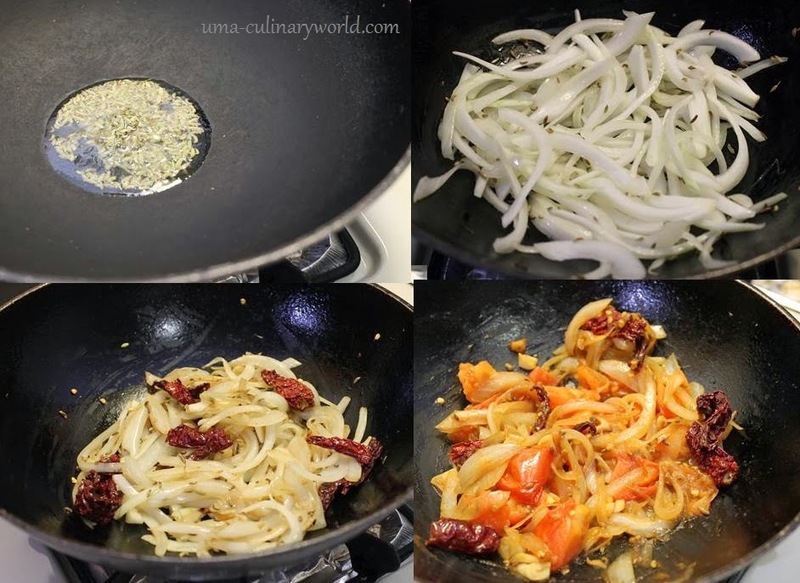 In the same pan, add the ground onion tomato paste. Add bay leaf, star anise and cinnamon stick. You can remove these whole spices before serving. Saute the onion tomato paste for a minute. Now, add paneer cubes, crushed kasuri methi, salt and garam masala. Stir and cook it covered for a minute. Lastly, add the almond milk paste and stir. Add water if required. I added about 3/4 cup water. Cook it covered until the curry comes to a boil. Garnish with cilantro and serve Paneer Makhani with roti, naan, rice. 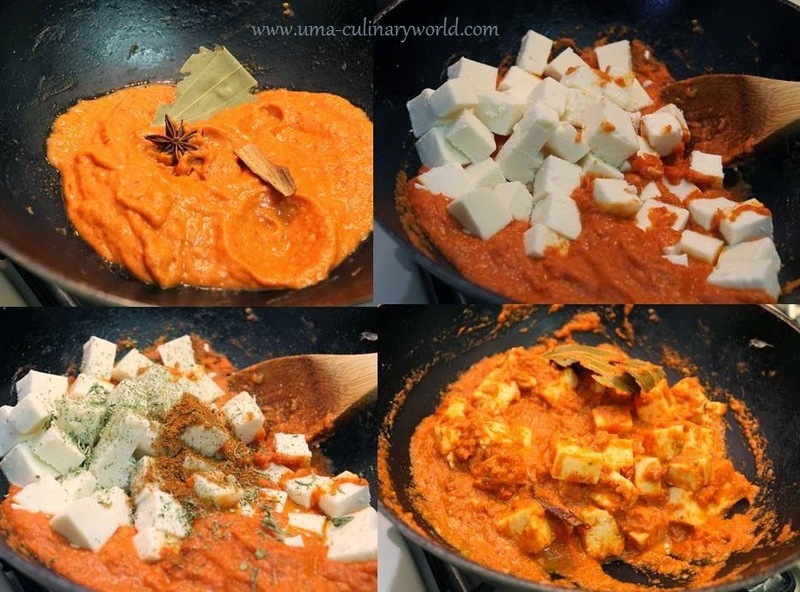 Simply yummy and delicious looking paneer butter masala. Excellent texture.